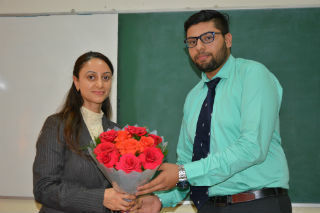 JIMS Rohini organised a guest lecture on “Profesional Ethics and Frauds” for the students of PGDM Retail Management on 30thOctober 2018. 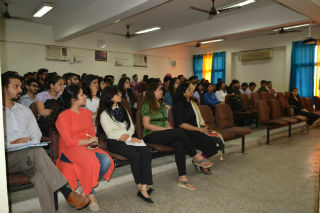 The resource person of the session was Ms. Ambika Sharma Solanki, Senior Teacher Fellow, Birmingham City University. Ms. Solanki started her session with the importance of professional ethics, and various ethical practices being followed by the professionals. She emphasized that ethics is a branch of philosophy that addresses the concepts of right and wrong or good and evil; and professional ethics are principles that govern the behaviour of a person or group in a business environment. Like values, professional ethics provide rules on how a person should act towards other people and institutions in a specific situation. She focused on the importance of ethics for a professional and how wrongful or criminal deception intended to result in financial or personal gain of person and he commits frauds. She explained the concept with various examples taken from the corporate world in order to make it understandable to students.